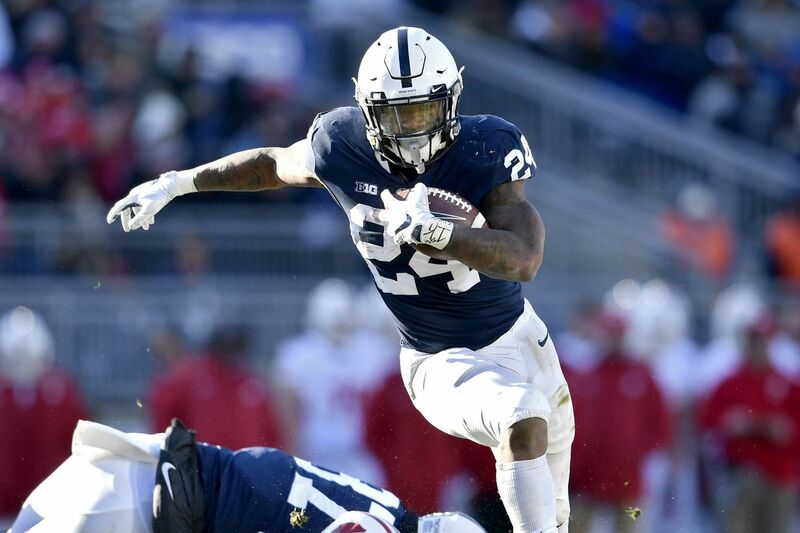 Miles Sanders might still be on the board when the Eagles make their second-round draft selections. Like every other NFL team, the Eagles will tell you they don’t go into the draft with a shopping list. Needs? Needs? We don’t care about no stinkin’ needs. We’re gonna take the best player available. That may be true, but rest assured that, when all is said and done next week, the Eagles will end up with several players who address needs, including a safety to eventually replace Malcolm Jenkins/Rodney McLeod, another pass rusher, another guy to block pass rushers, and, drum roll, please, a running back. The expected addition of another running back – possibly as early as the second round – is part of the Eagles’ annual Weapons for Carson fundraiser. They got Wentz wide receiver Alshon Jeffery via free agency two years ago, drafted tight end Dallas Goedert last year, and traded for field stretcher DeSean Jackson last month. They added a running back last month when they swapped a late-round 2020 draft pick to the Bears for Jordan Howard. But Howard, who is entering the final year of his rookie contract, essentially is a two-down back whom the Eagles hope can provide a boost to their first-down ground game, which nose-dived from second to 25th in the league last year without LeGarrette Blount. Howard joins a stable of backs that also includes Corey Clement, who is coming off an ACL tear and averaged just 3.8 yards per carry last season; Josh Adams, who led the Eagles in rushing as a rookie with 511 yards, but got just one carry in his team’s two playoff games; Wendell Smallwood, who running backs coach Duce Staley seems to trust about as far as he can throw him; and maybe – maybe – Darren Sproles, who has played in just nine games the last two years and turns 36 in June. While head coach Doug Pederson insists he’d be fine going to war next September with that group, the truth is they’d like to add a difference maker in the backfield next to Wentz. They don’t need an Ezekiel Elliott or Todd Gurley or Saquon Barkley. They don’t need somebody who is going to lug the ball 300 times a season. But they’d like to get an explosive three-down back who is dangerous in space and can be to Wentz what Alvin Kamara is to Drew Brees, and Melvin Gordon is to Philip Rivers, what James White is to Tom Brady, and what Tarik Cohen is becoming to Mitchell Trubisky. “Everybody’s trying to find another Kamara," NFL Network analyst Brian Baldinger said. “The things you can do with a guy like that, the term ‘matchup nightmare’ is overused. But there is some truth to it. I mean, who can cover Kamara? Nobody, really. “When you have a Kamara, a Melvin Gordon, guys who understand spacing, understand passing lanes, understand all of the underneath routes and everything you can do underneath, it’s huge." The Eagles haven’t had a running back with more than 28 catches since Sproles had 52 in Pederson’s first season as head coach in 2016. Last year, Eagles running backs had just 31 receiving first downs. The year before, only 26. “We’ve been fortunate to win a lot of games with the running backs that we have on this roster," Howie Roseman, the team’s executive vice-president of football operations, said a few weeks ago, before they traded for Howard. “But we’re going to continue to look at every position and look at ways to improve our football team." Josh Jacobs (8) might be the lone running back drafted in the first round. This year’s draft is fairly rich in versatile running back talent, with much of it expected to be mined in the second, third and fourth rounds, where the Eagles have a total of four picks. Alabama’s Josh Jacobs could be the only running back taken in the first round next week. Many mock drafts have linked him to the Eagles. But it’s unlikely he’ll still be on the board at 25. And even if he was, it’s unlikely they would take him. They haven’t drafted a running back in the first round since 1986, when the late Buddy Ryan took “medical reject" Keith Byars. The nicest thing Pederson could find to say about Jacobs late last month at the league meeting in Phoenix was that “he can give you that first down-second down productivity." The fact that he didn’t mention third down speaks volumes. But there are a number of versatile three-down backs the Eagles might be able to get on Day 2 (Rounds 2-3) and early on Day 3, including Penn State’s Miles Sanders, Iowa State’s David Montgomery, Oklahoma State’s Justice Hill, and Texas A&M’s Trayveon Williams, all of whom would be excellent fits for Pederson’s offense. The Eagles have two picks in the second round, though both are late in the round (21st and 25th). They don’t have a third-round pick. Gave it away to Detroit last year for wide receiver Golden Tate, who has signed with the Giants. They have two late fourth-round picks (25th and 36th). The 5-10, 211-pound Sanders, who rushed for 1,274 yards and nine touchdowns last year after replacing Barkley in the Penn State backfield, is expected to be the second or third running back off the board, after Jacobs and possibly his Alabama teammate, Damien Harris. “Sanders has the most potential of any of the second-day backs," ESPN draft analyst Todd McShay said. “He’s got some explosiveness. He’s got size. He can catch the ball well. “I wouldn’t say he’s a finished product. He can still improve in pass protection and some little things. But I think he’s got the most potential after Josh Jacobs." The Eagles like Sanders. A lot. But it remains to be seen whether he’ll still be on the board when they select in the second round. David Montgomery (32) was a productive running back for Iowa State but ran a slow 40-yard-dash time at the combine. Montgomery was an extremely productive back at Iowa State, rushing for more than 2,300 yards and 24 touchdowns the last two years. He also averaged 7.8 yards per catch in the last two seasons. But his slow, 4.63 40 at the combine concerns some teams. Baldinger, who broadcasts Big 12 games for Fox Sports and has seen a lot of Montgomery the last two years, says it shouldn’t. “If you’re not looking at David Montgomery, you’re not doing your homework," he said. “He’s Kareem Hunt. He ran a 4.63, which everybody says is slow. But is that any different than Hunt [he ran a 4.62 before the 2017 draft] or [the Steelers’] James Conner [who ran a 4.65]? “He’s that guy. He’s got incredible contact balance. He’s extremely tough. He might not have the big-play ability that some teams are looking for. But he’s a very good football player. “Iowa State didn’t have a single offensive lineman that’s a draftable player. They didn’t move the line of scrimmage. So he had to fight for every yard he could get. He has that great balance and great vision. He’s going to be a really good pro." At 5-9 and 198 pounds, Hill is smaller than Montgomery, but more explosive. He ran a 4.40 40 and had a 40-inch vertical jump at the combine. He rushed for 1,467 yards and 15 touchdowns in 2017, and averaged 6.0 yards per carry last year. “They’re different backs," McShay said. “Hill can fly. He benefited from playing in a spread system where he had creases he could exploit. But as a change-of-pace back and a guy that can catch the football and you can move around, you’ll get some big-play opportunities with him." Said Baldinger: “If you’re looking for a comp, he’s Jamaal Charles. He’s Tevin Coleman. He’s an exceptional player. He was the fastest back at the combine. He’s 200 pounds. He’s been a guy who can carry the load. “I think he’s a special player. I think he can make the house calls. He’s a home-run hitter. And he’s a good kid. You’ll never have to worry about him [off the field]." Rodney Anderson, Oklahoma, Round 7-FA?